The docs you'll find here should explain everything you need to know about Visual Studio App Center, sometimes the docs are not as clear as they should be, or you're trying to do something that isn't (yet) covered in the docs. There's a dedicated support team ready to answer your product questions; look in the next section for instructions on how to connect with them. App Center, and its product documentation, are both a work in progress, we're making regular updates to both. If you have a suggestion for how to make the product better or how to make the documentation better, we want to hear from you. Look in the Providing feedback section of this document for information on how to give us your feedback. Get support for App Center directly from within the App Center portal (not here in the docs). Any time you need help, just click the blue chat button in the lower-right corner of any App Center page and the dedicated App Center support team will respond. Use the New Conversation button shown in the following figure to start a conversation with our support team. You'll even find the App Center Program Management team hopping in to join the conversation as needed. Use the Search for answers... input field to search help and troubleshooting documents that haven't made it into the formal docs yet. For additional information, or to browse a list of articles available through support, see the App Center Help Center. 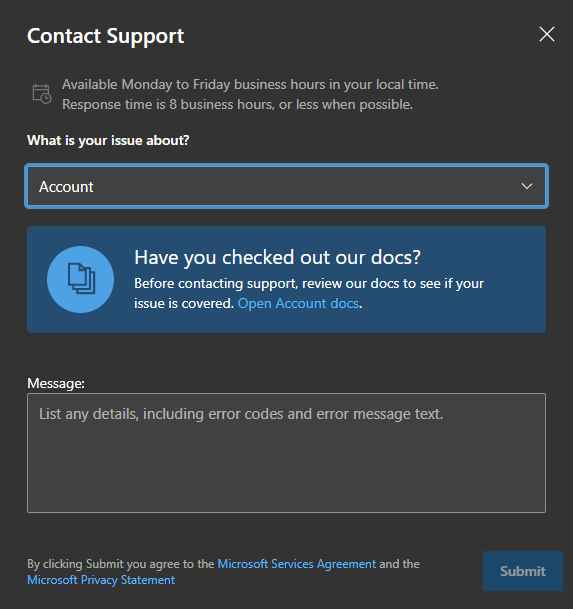 Customers with a Microsoft Premier Support account can file a support request in the Microsoft Premier Support Request Portal. If you are new to Microsoft Premier Support, you can learn about it in the Microsoft Premier Support Center. 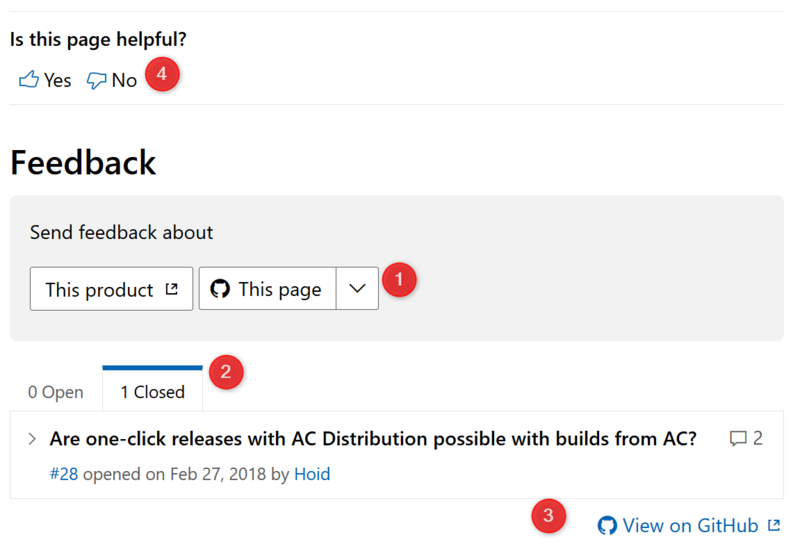 The Feedback section of the page lists two buttons; use the Product Feedback button to connect with the App Center Support team (as described in the previous section), use the Content Feedback button to suggest changes to the docs. In the bottom-right corner of the page you'll find a prompt asking you if the current page is helpful. Your vote here helps us understand how we're doing. Option 1 is the preferred method to provide feedback; the feedback you provide here goes directly to the App Center product team and will get you the quickest response. Option 2 simply records your vote (and comments), but doesn't provide a way for us to respond to you. The App Center docs are an open source project hosted on GitHub. When you choose the option to provide content feedback described in the previous section, you're really just creating a Github issue in the App Center docs repository. For more information on contributing to the App Center docs, read the Microsoft Docs contributor guide overview.